Figure 1. Releasing Diaphorencyrtus aligarhensis parasitoids onto citrus flush infested with Asian citrus psyllids. The natural enemies Diaphorencyrtus aligarhensis and Tamarixia radiata may have a future together in California. Over the past 11 years, the Asian citrus psyllid (ACP)-Candidatus Liberibacter asiaticus (CLas) (manifested as citrus greening) complex has become a “duo from hell” for Florida’s citrus industry, causing a substantial negative economic effect. A battle against the ACP-CLas complex in California is developing on many fronts in an attempt to mitigate outcomes similar to those observed in Florida. 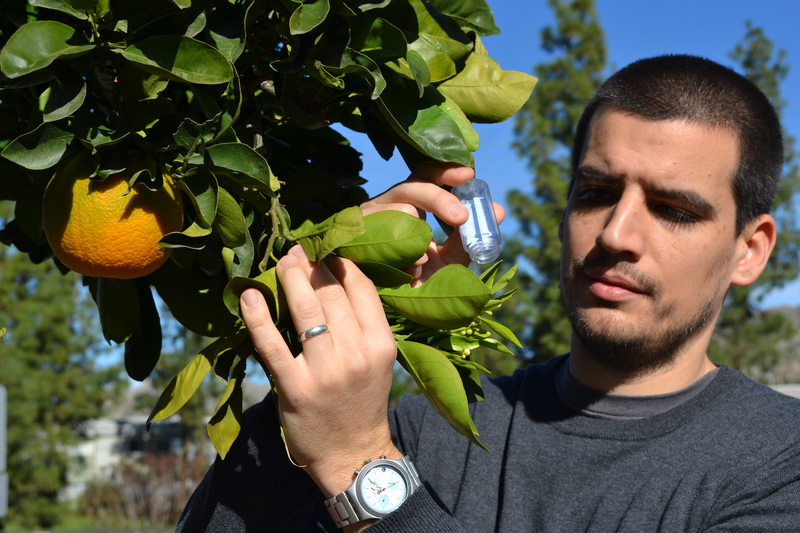 The top priority for California’s citrus industry has been to diminish the rate of spread of CLas where it resides in urban areas through vector (i.e., ACP) reduction. Untreated backyard citrus trees serve as reservoir “heaven” where ACP can thrive, while quietly building large populations that can migrate into nearby commercial citrus groves and increase the risk of disease spread. The chemical control program targeting urban ACP was inefficient, cost-prohibitive and was subsequently abandoned. The widespread release of the ACP’s two primary parasitoids, Diaphorencyrtus aligarhensis and Tamarixia radiata. T. radiata was the first parasitoid to leave the introduction pipeline in December 2011. Though approximately 3.5 million T. radiata have been released in Southern California to date, post-release monitoring indicates that ACP parasitism by T. radiata varies greatly depending on location and time of year. 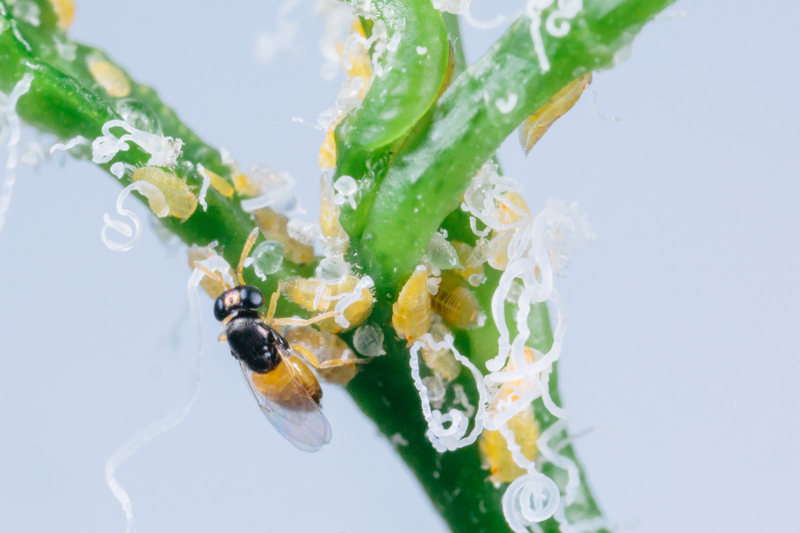 In December 2014, a second ACP parasitoid, D. aligarhensis (figures 1 and 2) joined the urban battle when it was released from quarantine. As of January 2017, more than 200,000 D. aligarhensis have been released in Southern California by UCR and CDFA. 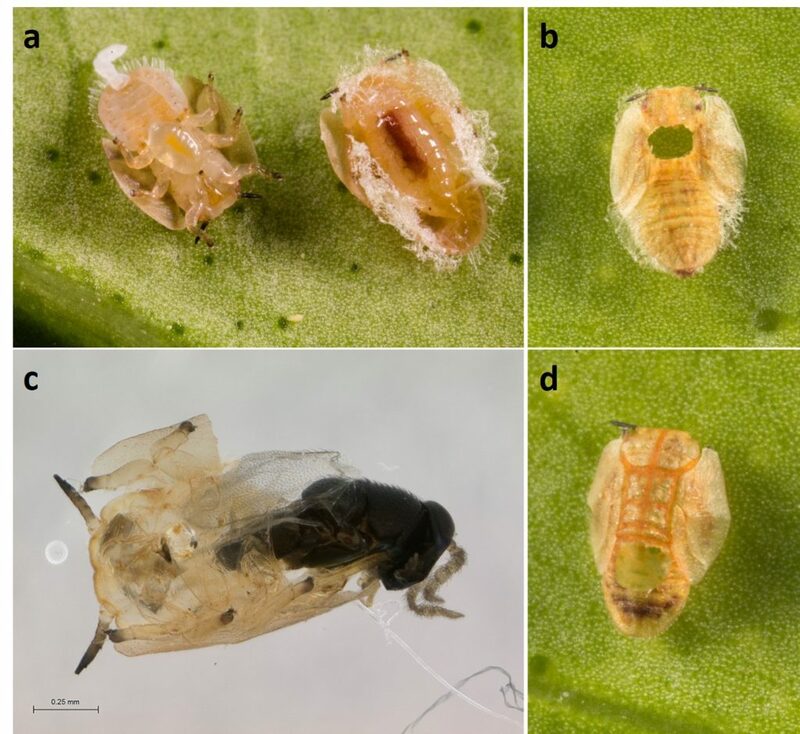 The concept underlying these efforts is the idea that D. aligarhensis may complement ACP parasitism by T. radiata, as the two parasitoid species attack different host stages (Figure 3). D. aligarhensis are being released in ACP-infested areas where competition from the widely established T. radiata may be low. Both parasitoids successfully co-exist in the native range, suggesting that the two species may both contribute to ACP biological control, perhaps through resource or geographic partitioning. As part of the classical biological control program, D. aligarhensis is being released in Orange, Los Angeles, San Diego, San Bernardino and Riverside counties (Table 1). Since the initiation of the project in October 2015, a total of 68,500 parasitoids (male and female combined) have been released at 15 sites. Parasitoid releases and numbers released are contingent upon the presence of the pest on the flush patterns of trees at each study site. Citrus at these sites will be monitored for a minimum of two years to determine: 1) the ability of D. aligarhensis to establish permanent, self-sustaining populations in Southern California and 2) the impact of D. aligarhensis activity (parasitism and host feeding) on populations of ACP. To date, evidence of D. aligarhensis parasitism of ACP has been found at a total of 13 surveyed sites (Table 1). In addition, multiple recoveries of D. aligarhensis have been made at about 60 percent of sites where this species has been released. It is possible, however, that California could provide a more suitable environment for D. aligarhensis establishment and proliferation. First, California’s biocontrol program for ACP utilizes sexually reproducing D. aligarhensis populations sourced from Pakistan (an area with a 70 percent climate match with California), whereas Florida’s releases use female-only populations from Taiwan. Second, releases of D. aligarhensis in California are focused exclusively on urban backyard citrus where pesticide use is limited, whereas Florida’s releases occurred primarily in pesticide-treated commercial citrus groves. Third, multiple recoveries of D. aligarhensis across different release sites over time tentatively suggest that D. aligarhensis and T. radiata could co-exist, which may possibly increase ACP biocontrol in California. Ivan Milosavljević is a postdoctoral researcher and Mark S. Hoddle is an Extension specialist in biological control and the director of the Center for Invasive Species Research, both in the Department of Entomology, University of California, Riverside.